The movement of freight between Northern Ireland and England has been boosted by the unveiling of a new vessel on the route. Stena Line’s Stena Edda is the second vessel in the ferry company’s next-generation E-Flexer series, and is scheduled to enter service on the Belfast-Liverpool route in spring 2020. 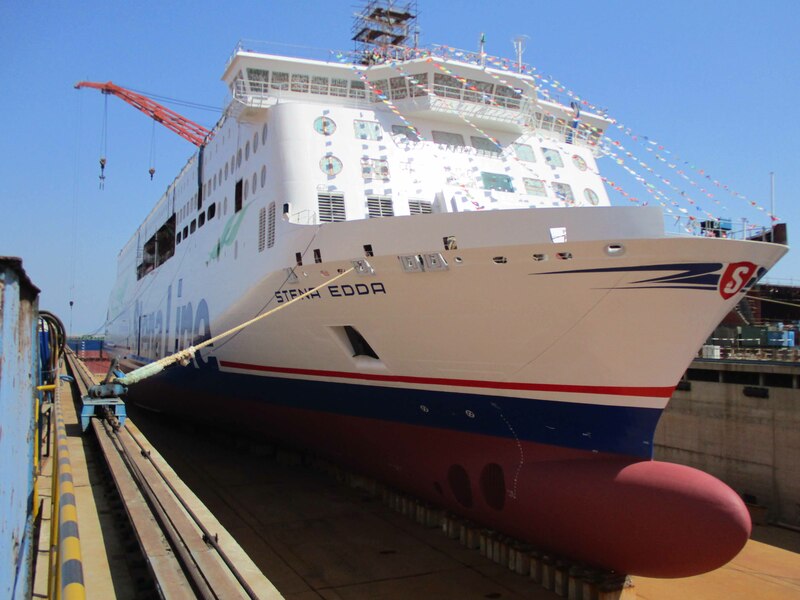 The second of three new E-Flexer vessels bound for the Irish Sea over the next two years, Stena Edda’s ‘float out’ ceremony was held this week at the Avic Weihai Shipyard in China. The three vessels being built for the Irish Sea are 215m each and will be larger than today’s standard RoPax vessels, providing freight capacity of 3,100 lane metres and the space to carry 120 cars and 1,000 passengers and crew. Crucially for companies transporting across the sea, capacity on the Belfast-Liverpool route will increase by almost 20 per cent on the current levels, according to Stena. The vessels have also been designed for sustainability and will be highly fuel efficient to help reduce emissions. As well as the three Irish Sea-bound E-Flexer vessels, Stena Line also revealed it has ordered a further two E-Flexer RoPax vessels with a larger design, to be deployed within Stena Line’s network in 2022. These larger ships will be 240m long with a total freight capacity of 3,600 lane metres, and passenger capacity of 1,200.